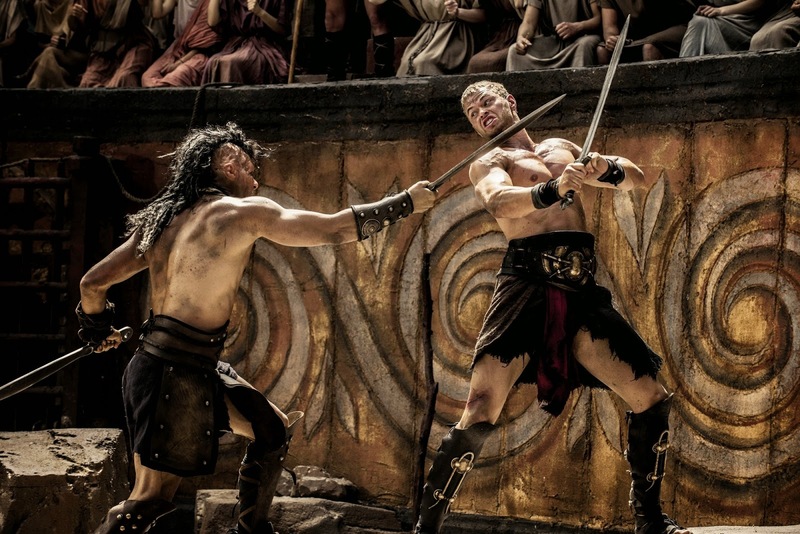 This is the first of the two Hercules movies expected this year. January is the perfect time to bring out a popcorn, mindless, mayhem tale by the director Renny Harlin. There's a handful of writers credited with the bloated storyline including Harlin with Daniel Giat, Giulio Steve, and Sean Hood. The film is shot like a comic book and in 3D. Everything looks like it they used the same computer graphics as in 300. Nothing looks real or natural. All the fighting is in slo-mo. Literally ALL the fighting. The story starts with two kings battling for control of the kingdom of Argo. King Amphitryon (Scott Adkins) says he's doing it to give his wife. She's disappointed in this warrior attitude because the land they invaded was at peace with them. She goes to pray to Hera who overs her a night with Zeus who has been lusting after her. Hera's messenger tells Queen Alcmene (Roxanne McKee) that she will give birth to a son and she should name him Hercules. The King sort of suspects that the boy is not his son, give him another name and tells him that he won't be the heir. Somehow 20 years later, Hercules (Kellen Lutz) grows up to be a big strapping, handsome younger brother to his smarmy older bro Iphicles (Liam Garrigan). Things get really uncomfortable when Hercules' girlfriend the princess of Crete, Hebe (Gaia Weiss) is betrothed to marry his brother. To get Hercules out the way stepdad sends him on an ill fated mission to Egypt where he is reported dead and his army defeated. Captain Sotiris (Liam McIntyre) and Hercules do survive and are sold as slaves to a cage fight to the death for sport. They talk the fight manager into taking them to Greece to take on the MMA championship where they have to fight 6 of the greatest fighters at one time. Of course there's lots of battles going on on the way to the big arena. Hercules ends up taking on the fighters on his own. He makes neat work of the them too quickly. But apparently there's too much story they had to get to indulge. Back at the ranch, the kingdom of Argo isn't going to well. Mom thinks Hercules is dead and tries to kill daddy dearest. Bro is getting all freaked out because his impending wedding with Hebe doesn't quite make her happy. The peasants are getting squeezed for taxes, the army is having to hire mercenaries. It's ripe for Hercules to come home and gather a rebel army to oust the King. Eventually Hercules is going to have to accept his role as son as Zeus and play that card. An he means to get his girl! Complicated names aside, and accents that seem to come and go, familiar faced actors forced to recite really stiff dialogue and some rad looking leather to enhance Kellen Lutz's well toned pecs, it's not a terrible movie. It's somewhat entertaining. It's also nothing like Kevin Sorbo's Hercules. It's also January and there's nothing else going on.